Friends sometimes compliment a photo that has captured a decisive moment, I suppose because they think that my reaction time was extraordinary. What they may not realize is that reaction time has little to do with capturing just the right moment in photography. What counts—I learned this from reading about Cartier Bresson— is anticipating an event that is about to unfold, noticing something in the offing, and being ready when it comes. 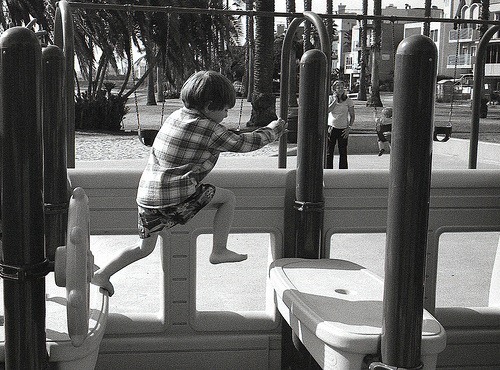 Out of the corner of my eye (the one aware of action outside the finder as I peer through my rangefinder camera’s viewing window) I see my grandson about to leap across the gap. I have already figured I’ll need a 1/1000 second shutter speed to capture the leap with clarity. I’ve set my camera for the right aperture at that speed. I start pressing the shutter button as I sense he is going through with it. Got him! Right in mid air. Not so much because I had extraordinary reaction time, but because I planned the whole thing as I saw the event unfolding. 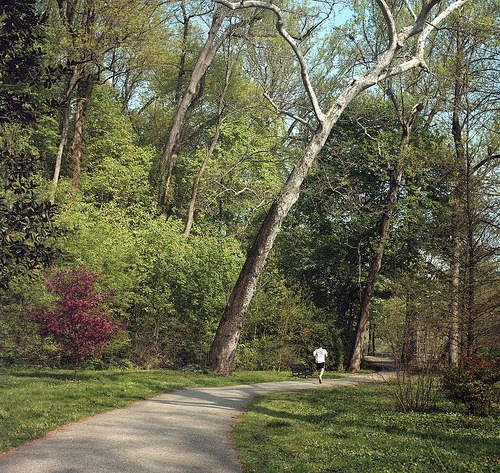 Another example: In the woods I see a leaning tree, a sinuous path, an inviting composition. All it lacks is a walker, a rivet for the eye. I focus on the point in the sunshine where I want him to pass, and I wait patiently for a walker to make his way to me through the woods and down the path ahead. Eventually he arrives, and when he steps into the right spot I gently depress the shutter. 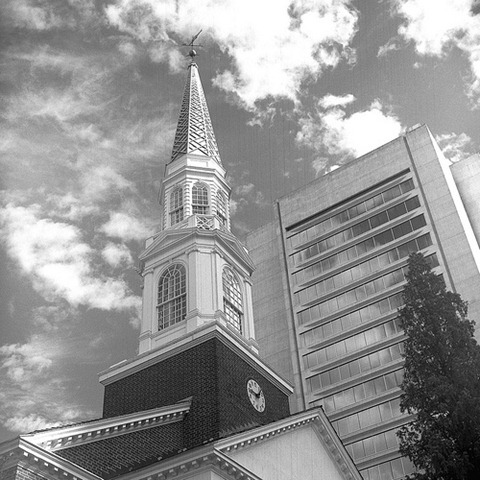 Third example, one that took more than a year of anticipating: I see how nicely the classical church spire compliments the modern sky scraper. But my vision for the composition requires a dramatic sky, and just the right light. I wait for those conditions to arrive, but I have many months to wait. Then, on a windy Spring morning the sky and the light arrive and I am ready. Clever to have captured just the right moment? No– imaginative, and patient. It is nice to definitely dig up a web site where the blogger is sophisticated. Thanks for creating your website. You’re welcome, Chiriqui. Please pass the word about CyberKenBlog.